Just because you're following a vegan diet doesn't mean you have to skip the appetizers or settle for bland-tasting recipes. Vegan appetizers can be just as delicious and nutritious (even more so in many cases) as traditional appetizers. 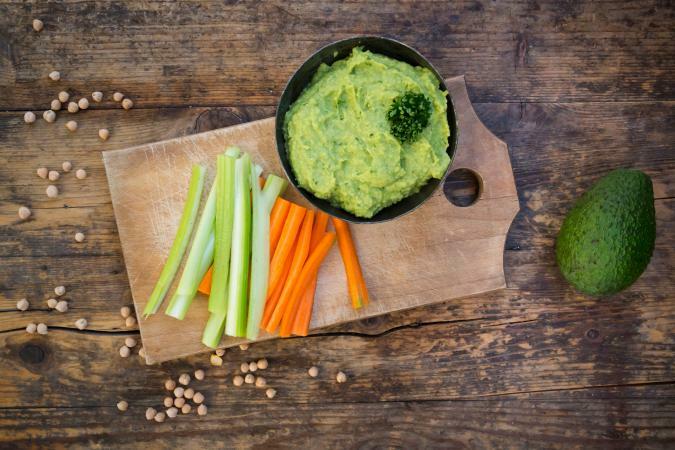 Light and refreshing (and loaded with nutrients), avocado hummus works well as an appetizer for any vegan dinner theme. Serve it with veggie sticks, pita chips, or bread of your choice. Place chickpeas, tahini, avocado, lime juice, cilantro, garlic and seasonings in a food processor. Process mixture until smooth (about 60 seconds). Slowly add in olive oil and process (another 60 seconds or so) until mixture is light and creamy. Top with pumpkin seeds if desired (optional), and serve with veggie sticks or pita bread. 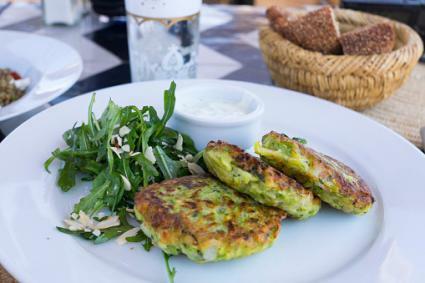 You won't be sorry you picked zucchini fritters to round out your vegan dinner menu, as these flavorful appetizers will make your mouth water. Sprinkle the zucchini with 1 teaspoon of salt over a colander and drain for 10 minutes. Squeeze the zucchini to get out all excess liquid. Mix in remaining ingredients (except olive oil). Add the zucchini batter (in 2-tablespoon portions) and brown; cook each fritter about 3 to 4 minutes per side. Serve with vegan Greek yogurt, if desired. When you're in the mood for flavorful (yet light) taco dip without the meat, try this vegan taco salad dip recipe served with chips. Season vegan meat crumbles according to taco seasoning instructions (or use pre-seasoned vegan taco crumbles). Place lettuce on large serving platter, and top with vegan meat crumbles and vegan sour cream. Sprinkle with mandarin oranges and avocado and serve with chips. Garnish with cilantro and a lime, if desired. 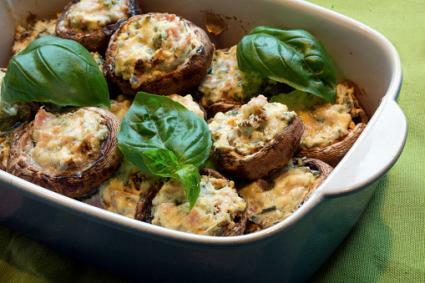 You can't go wrong when choosing stuffed mushrooms as your next dinner party appetizer and going vegan doesn't mean you have to bypass flavor. In fact, party guests may not even realize what you're serving is vegan. Wash mushrooms and break off stems. Sautee stems and garlic in oil in a skillet over medium heat until soft (about 2 minutes). Let the mixture cool in a medium-sized bowl. Add the vegan cream cheese, vegan bacon bits, and seasonings, and mix well. Fill mushrooms caps with cream cheese stuffing and place on a cookie sheet sprayed with cooking spray. 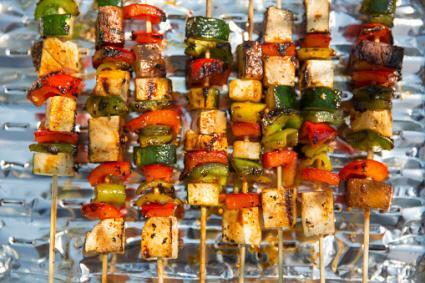 Replace chicken with tofu in kabobs at your next dinner party for a vegan alternative everybody will love. Whisk together soy sauce, oil, garlic, and vinegar in large bowl until well blended. Add the tofu; coat the tofu with soy sauce mixture. Thread skewers with tofu, red peppers, green pepper, and zucchini in a pattern of your choice (see image). Grill skewers for 5 to 10 minutes or until brown. Baste with remaining marinade while grilling as needed. A vegan Quiche recipe works well as a breakfast or appetizer. This dish uses tofu and plant-based milk instead of eggs and dairy products. It's bursting with flavor and packed with protein, healthy fats, veggies, vitamins, and minerals. This recipe is one the whole family will enjoy! Flavorful, nutritious and colorful, this vegan edamame salad recipe works as a side dish or appetizer served with whole-grain chips or crackers. Satiating and loaded with protein and fiber, it's simple to prepare and contains just five ingredients. Plus, edamame salad adds color to your dinner table to wow party guests. Another brightly-colored vegan appetizer recipe that'll satisfy you like no other is quinoa sweet potato lettuce wraps. This dish is so well-balanced you can even eat it as a main dish when you're in the mood for something light. 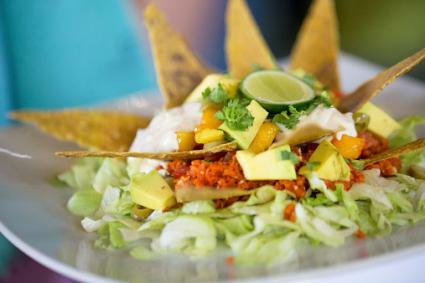 Salsa, black beans, quinoa, and avocado are beautifully presented on lettuce leaves to complete the dish. When you're in the mood for something sweet, consider a mango salsa recipe as your next vegan appetizer. Ingredients in this dish include black beans, mango slices, red pepper, tomatoes, rice, corn, broth, oil, and a variety of seasonings that blend together perfectly. Pair vegan mango salsa with pita bread, pita chips, or whole-grain chips or crackers. It also works well when eaten by itself. Add extra protein to your vegan appetizer menu by choosing a vegan Italian Sausage recipe. Instead of meat, the recipe calls for vital wheat gluten and chickpea flour -- combined with seasonings, yeast flakes, olive oil, soy sauce and vegetable stock. Roll it into small balls or patties and serve with toothpicks. This recipe is perfect for any occasion. Just because you're serving vegan appetizers doesn't mean you have to sacrifice taste. When choosing the right delicious vegan recipes, your guests won't even realize they're eating entirely plant-based foods!